"Privately rented - fully equipped 2-3-or 5 bedroom chalet accommodation, this deluxe lodging has excellent ski to/from access with a spectacular panoramic view of Silver Star Mountain!" Silver Star Mountain Resort is a unique ski destination in North America with dry Okanagan powder snow, superb grooming; 2,725 ski able acres - 107 marked downhill trails, 1 - Half Pipe and 1 boarder cross track for snowboarding, 105km cross-country groomed track-set trails. Other Activities to enjoy - tobogganing, tubing park, skating, horse-drawn wagon rides, dog-sled rides, guided snowmobile and snowshoe safaris through the snowy forest. The length of the ski season is from Mid-November to Mid-April. 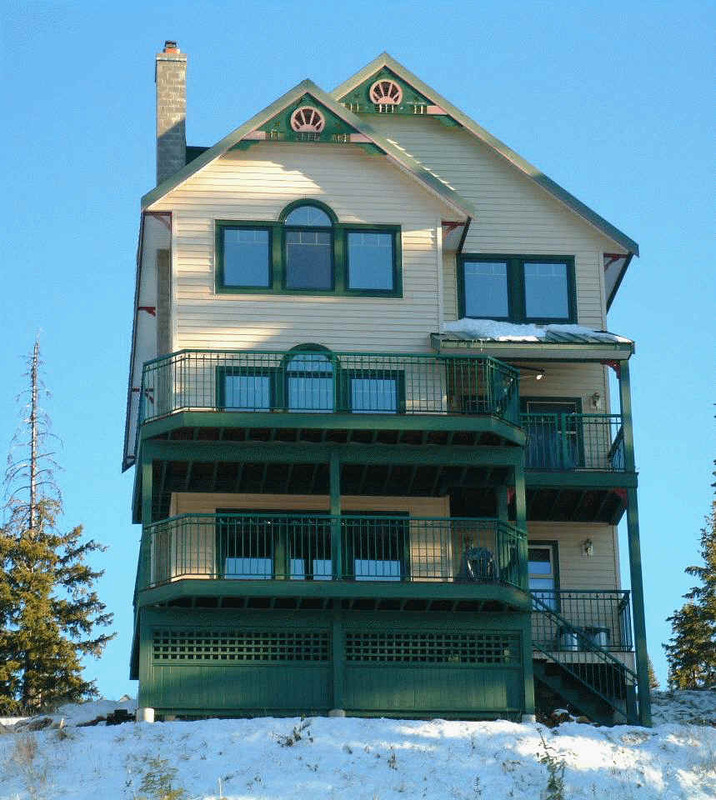 Our family owned lodging features a picturesque window side seating view of Silver Star Mountain. Private parking area, hot tub, jacuzzi jet bath tubs, dry cedar sauna, fireplaces, a two minute walk to Silver Star Mountain ski village and all mountain amenities, the Nordic ski trail passes below our accommodation. We offer two fully equipped family oriented rental accommodations. The Upper Suite has two levels, sleeps up to 12. The Lower Suite has one level, sleeps up to 8. Silver Star Mountain Ski Resort is a great winter and summer alpine vacation playground. There is something for everyone to enjoy. Even if it is just going for a inspiring walk in the crisp mountain air or relaxing in front of a warm cozy fire relishing the breathtaking view of Silver Star from the Star Gazer Ski Chalet.